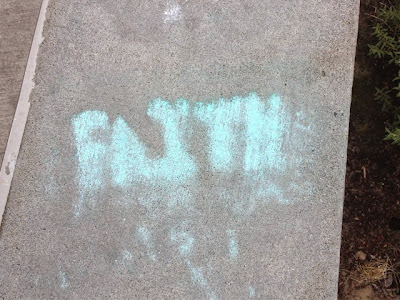 When I think about what went wrong in the big game on Sunday against the Patriots, I keep coming back to the word FAITH. All season long, even when it didn't make any sense, that's what this Seahawks team had. They had FAITH. In themselves and in each other. Faith, faith, faith. And it seems to me that in the last seconds of the Super Bowl they lost it. They got scared and they forgot who they are. They forgot that if you have twenty seconds on the clock and three tries and you give the ball to Marshawn Lynch he WILL make it across that goal line even if - maybe especially if - everyone on the other team knows he's going to have the ball. This lack of faith - in themselves and in each other - cost them this game. And it is so sad. It is heart-breaking, really, on so many levels. After the miraculous win against the Packers and after the miraculous catch just minutes prior and after all the talk about cheating and deflated balls, it just doesn't make sense that they lost this game. Until you realize that they lost faith. For just twenty seconds they lost it, and it cost them the Super Bowl. Now they have to get it back. We all do. How many times has this happened to you? How many times have you lost faith in yourself? In those around you? I think it happens to me multiple times a day sometimes. And what does it cost us? How many dropped balls? How many missed opportunities? The fact is, it is human to lose faith. We all do it and we all suffer for it. And all we can do is try to get it back and keep on going. It's what I'm doing this week. It's what I hope the Seahawks are doing this week. And I hope you are too. "Faith is the courage to treat everything that happens as exactly what you need for your highest good and learning." --Dan Millman, "Everyday Enlightenment"